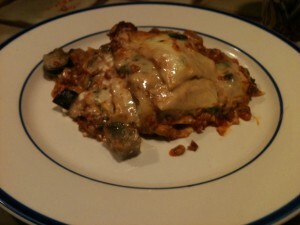 While many people like plain cheesy lasagna, I think it can be better with a few added ingredients. Not only for taste mind you, but you can add vegetables in there and it is better. When making casserole or a lasagna, there are flavor givers (chorizo, ground beef) and there are flavor sponges like mushrooms, eggplant that absorb the flavors around them. For me, this makes a better dish. 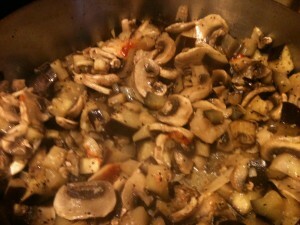 Since chorizo is so rich, I thought by adding eggplant and mushrooms it would provide balance to the dish. 2 pounds sauted browned meat and add to the red sauce below. 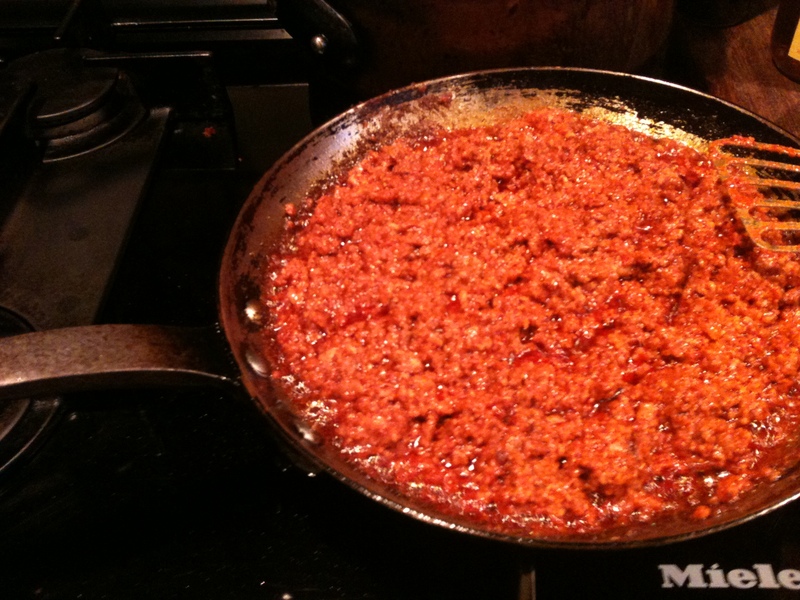 (Chorizo or a combination of ground beef, or chicken or turkey, or italian sausage – removed from the casing.) 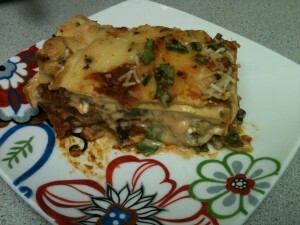 My husband likes more meat, so he would have liked this lasagna better with more ground beef. He told me this two times! Once you have the ingredients sauted you are ready to start layering in the pan. Four layers is your target. I start with a base of red sauce (which has your chorizo in it), top with 4 lasagna noodles or whatever number fits in the bottom of your pan. You can overlap a bit. 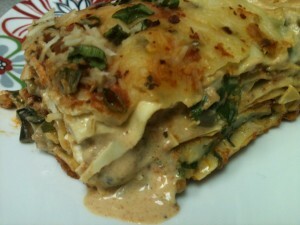 Next top with cheese sauce, then your vegetables; sauted eggplant and mushrooms; sprinkle with grated cheese. Next add spinach, pepper jack cheese slices and start over. The cottage cheese is for one of the middle layers. 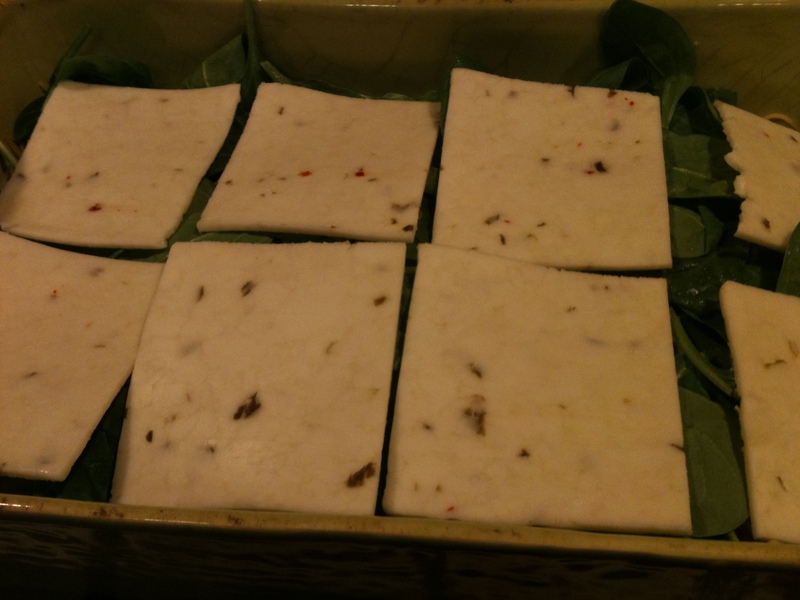 Drop it by teaspoonfuls onto the spinach layer. The cottage cheese lightens the whole mixture and adds texture. 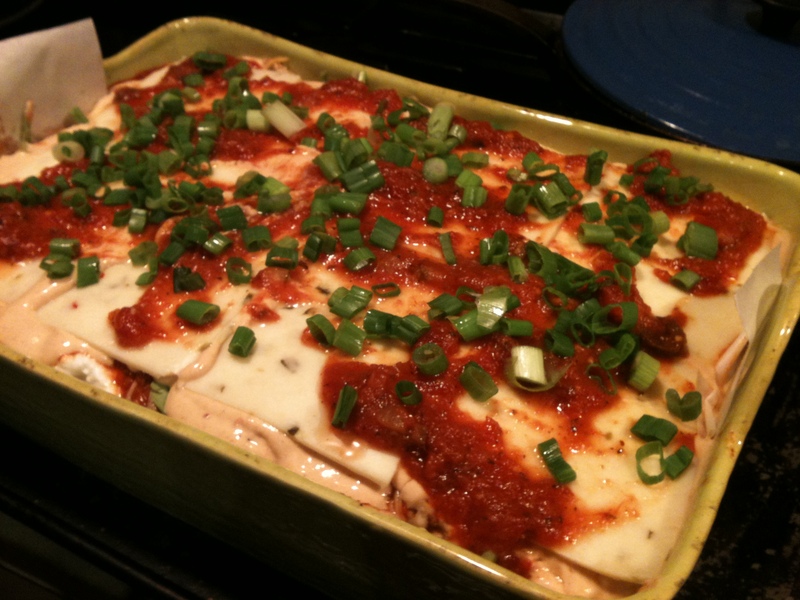 Your last layer should be Cheese Sauce with grated cheese, parmesan and scallions and then sprinkle with red pepper flakes. It will look nice this way. You’ll notice small parchment paper tucked in along my baking dish. 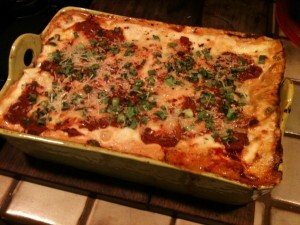 This lasagna is so deep, and my pan has hand holds, that I need to cover until the dish cooks. Place in the oven at 375 degrees for 50-60 minutes covered with foil until bubbly, then 10 minutes uncovered to finish melting the cheesy top. 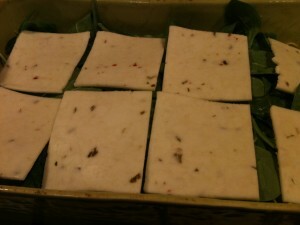 Let it cool for 15-20 minutes so it holds its shape for cutting. You can put this together the morning before or even a week before and freeze. If you do freeze, just extend your oven time to 90 minutes or so. Serve with a nice green salad. If you cool it properly you can see all the layers. Cool it properly and it stands up! This entry was posted in Italian Restaurant, Mexican Restaurant and tagged Chorizo, Eggplant, Italian, Lasagna, Mushrooms, Spinach. Bookmark the permalink.